You better crack them knuckles, Jennings. Watson is running this town! While Wheel of Fortune gears up for day three of "Teen Best Friends Week" (not kidding), Jeopardy! enters the final day of their 3-day "Man vs. Machine" tournament as two humans (not proven) take on IBM's mega-computer, Watson. So far, after two days, it's been a total whitewash as Watson is destroying Jeopardy! 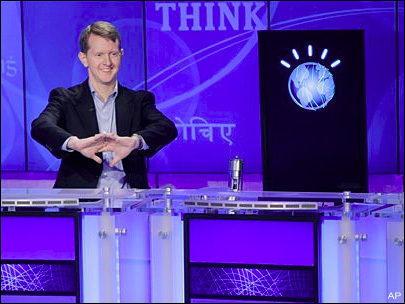 's all-time champs, Ken Jennings and some other guy. But it's not because Watson's smarter, he's just able to buzz-in quicker! The two human nerds TOTALLY know all the answers too. Not fair! Toronto's not even in the United States, Watson! At least not until our evil computers take over Canada! Watson currently leads by over $20,000. I am terrified of the future. I am also terrified of "Teen Best Friends." Adolescents are dangerous! Here's a link to the NYT's articles from today and yesterday. And a link to my Jeopardy! vs. Wheel of Fortune post here. I hate Watson. I don't get why the human cyborgs don't just buzz in immediately. That cocky computer needs to go down. I jsut hope Watson doesn't blow his winnings on prostitutes and drugs.